Hello! 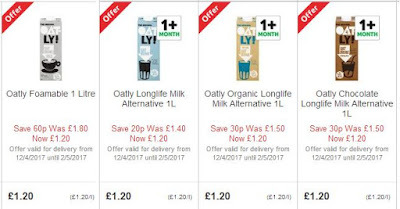 Tesco have an offer at the moment on Oatly long life milks, including Foamable! Original, Organic, Chocolate AND Foamable have all been reduced to £1.20 until 2nd May 2017. This is a pretty good deal on 3 of the Oatlys, but an amazing deal on Foamable as this is usually £1.80. EDIT: There are more places with Oatly on offer! Waitrose! 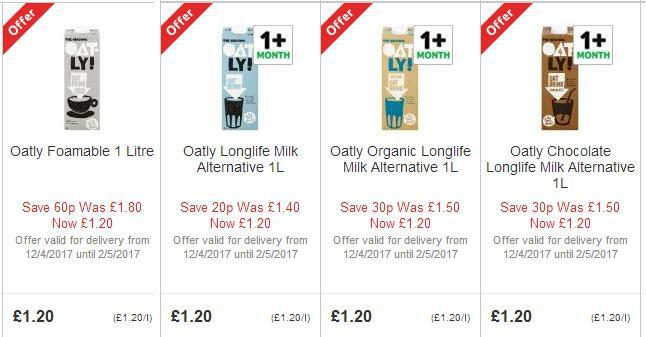 You can get Oatly original longlife for £1.05, Oatly chocolate or organic for £1.12 and Oatly Foamable for £1.35. These are all until 18th April. Sainsbury's also have an Oatly offer. All types are £1.20, saving you 60p on Foamable. This offer is until 25th April 2017. So if you like Oatly, particularly Foamable, now is the time to stock up. If you buy it from Tesco or Sainsbury's, buying 2 saves you the price of 1!